The statistic shows Mexico’s GDP from 2012 to 2017, with projections up until 2022. In 2017, Mexico’s GDP amounted to approximately 1.15 trillion US dollars. GDP is an indicator primarily used to gauge the state and health of a national economy. 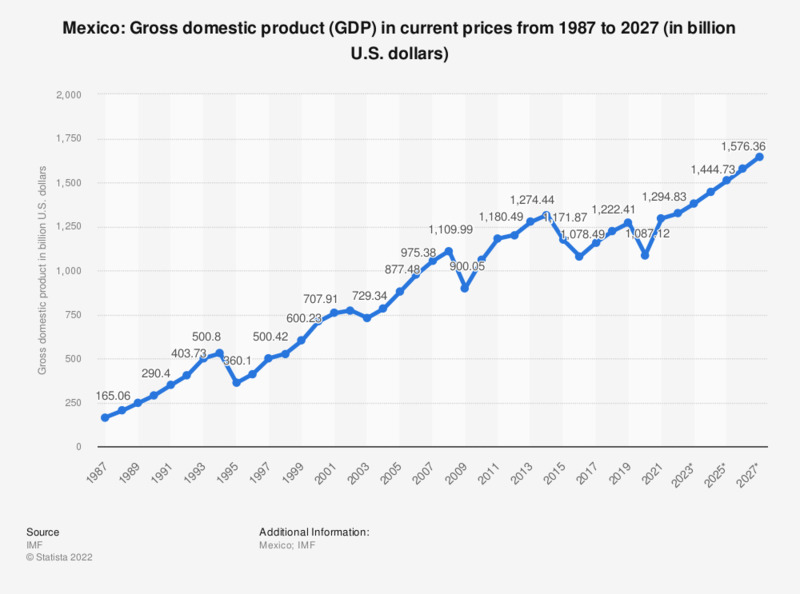 GDP is the total market value of all final goods and services that have been produced within national borders in a given period of time, usually a year. GDP gives us an insight into a country’s economic development over a period of time, how its development fits in with international shifts and how it is affected by the factors that affect market economies. The demand among some segments of the Chinese workforce for fairer payment, coupled with higher transportations costs, have been key factors in increasing the competitiveness of Mexican manufacturing, with some suggestions being made that it is already cheaper than China for the many industries that serve the lucrative United States market. The Mexican economy is, however, far from trouble-free. And although the gross domestic product in Mexico has been increasing, it is showing that it is struggling to match up to the fast pace of growth and prosperity being seen in some of the BRIC countries, as well as the usual suspects of economic success, the United States, Canada and others. Inequality in Mexico remains a huge problem. The education system in the federation’s thirty-one states is in dire need of reform, and in some of the states, especially in those closest to the US border, brutal criminal drug lords'rule. It is important for Mexicans that they embrace the opportunity that they find themselves presented with at present and harness the energy of their large population , the newly arrived foreigners and their educated youth, in order to provide the country with the future prosperity that it most desperately needs. Statistics on "Economic Outlook Mexico"
If money was no object and you planned to vacation outside the U.S., would you feel safe going on vacation in Mexico? U.S. population: How many bags of Popchips potato chips have you eaten in the last 30 days?